What do you call a cake that will never give you up, let you down, or hurt you? 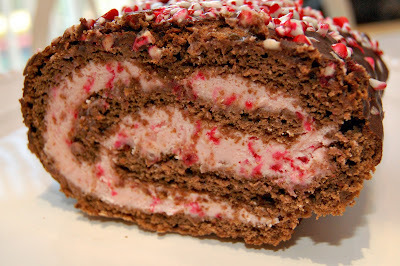 A Rick Roll, obviously, but it might dessert you, so you're better off with this peppermint roll. 'Tis the season for pretty desserts, right? I love chocolate and peppermint together. I made a rather fantastic discovery in the bulk foods section of the grocery store the other day--you can buy crushed peppermint candies by the pound. Maybe everyone else knew that already? I'd been buying candy canes or starlight mints, unwrapping them, and going hog wild with a meat mallet. Bulk candy is a much nicer/neater solution. I assembled this in a very Frankenstein fashion, borrowing bits from different recipes. The cake is from Taste of Home, the filling a minty spin on a recipe from Tasty Kitchen, the ganache a leftover bit of my favorite All Recipes stand-by. It worked. If I was going to change anything, I'd maybe make the chocolate in the cake more pronounced, maybe use some black cocoa. In a large bowl, beat egg yolks until slightly thickened. Gradually add 3/4 cup sugar, beating until thick and lemon colored. Beat in water and vanilla. Combine the flour, cocoa, baking powder and salt; gradually add to yolk mixture and mix well. In another large bowl, beat egg whites until soft peaks form. Add remaining sugar, 1 tablespoon at a time, beating to stiff peaks. Gradually fold into batter. Line a greased 15-in. x 10-in. x 1-in. jellyroll pan with parchment paper. Spread batter evenly in pan. Bake for 10-15 minutes or until cake springs back when lightly touched. Cool for 5 minutes. 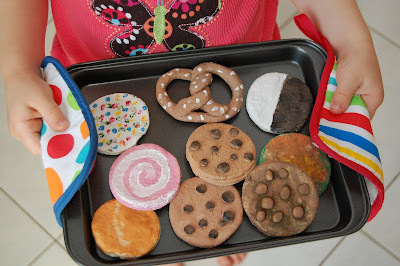 Invert cake onto a kitchen towel dusted with confectioners' sugar. Gently peel off paper. 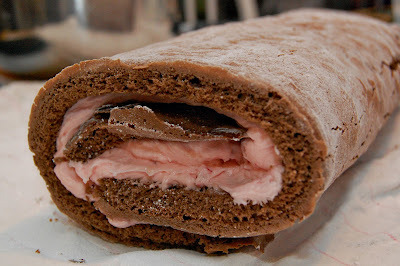 Roll up cake in the towel, jelly-roll style, starting with a short side. Cool on a wire rack. In a small saucepan over medium heat, whisk together 1 c. of milk and 5 T. of AP flour until smooth and very thick, almost a paste. Remove from heat and allow to cool to room temperature. Stir in 1 tsp. peppermint extract. Cream together 1 c. of unsalted butter and 1 c. of granulated sugar until light and fluffy, not grainy. Add a few drops of red food coloring, if desired. Beat in flour/milk/peppermint mixture and mix until smooth and mixture resembles whipped cream (you might have to beat it a while!). Taste to see if you need any more peppermint. Stir in 1/2 c. crushed peppermint candy. Gingerly unroll the cake and spread with the filling. It's ok if it cracks a little in some places. Reroll. Heat 1 c. whipping cream to boiling, stirring frequently. Pour hot cream over 10 oz. finely chopped bittersweet chocolate. Allow to stand for 30 seconds, then stir until smooth. Allow ganache to cool until it thickens enough to spread rather than run down the sides. 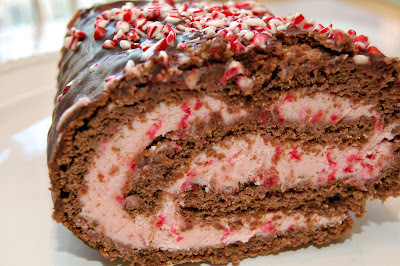 Top cake roll with ganache and sprinkle with a few tablespoons of crushed peppermint candy.